This topic provides a description of the controls on the Adjust Colors dialog. To adjust colors of an opened image click Adjust Colors... menu item from the Tools menu. 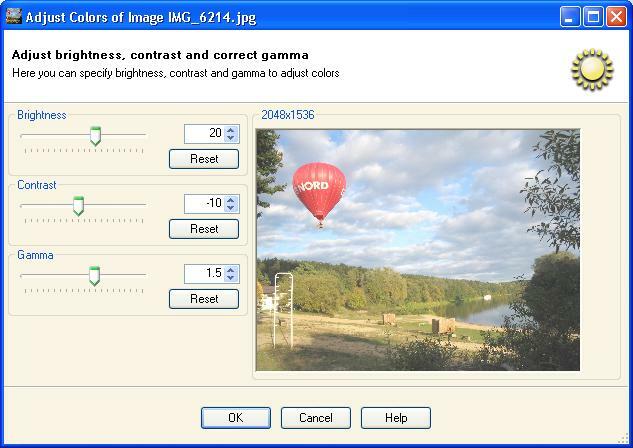 You can adjust brightness, contrast and correct gamma of the selected image using slider controls or entering values. You can preview the changes in the same window. To reset brightness, contrast or gamma value to original press corresponding Reset button. You can specify percentage brightness value in range [-100, 100]. A value of 0 means no change, less than 0 will make the image darker and greater than 0 will make the image brighter. You can specify percentage contrast value in range [-100, 100]. A value of 0 means no change, less than 0 will decrease the contrast and greater than 0 will increase the contrast of the image. You can specify gamma value to be used for gamma correction in range [0.1, 10]. A value of 1.0 leaves the image alone, less than one darkens it, and greater than one lightens it. Press OK button to apply color adjustment to the image and display adjusted image in a new tab page.